Giethoorn - often referred to as "Little Venice" or "Venice of the North" is a quiet little village, located in the North East of the Netherlands. This picture-perfect village has no roads, and the only access is by water over the 55 miles of beautiful canals or on foot over its 180 wooden arch bridges. It is so peaceful and so tranquil, that you will truly romanticize the nature. The loudest noise you can hear here is the chirping of the birds or the quacking of the ducks. For anyone who dreams of a simple village life with beautiful nature around, Giethoorn will be a heaven. Disclaimer😈: don't get carried away by the nickname (Venice of the North); Giethoorn is much much smaller, with no big historical or architectural monuments, museums nor attractions. It’s a very simple, small, but beautiful village. If you’re a nature lover, its worth a day-trip from Amsterdam or for a peaceful short vacation. By Train: The nearest train station is Steenwijk. From there you can take bus/taxi to reach the Giethoorn. You use ns.nl to plan your journey time and train fare. By Bus: You can board bus line no 70 from Steenwijk train station. Buses are not that often, you have service only once per hour. It takes about 20 minutes from Steenwijk to Giethoorn. The bus stop that you need to get down at Giethoorn is called “Dominee Hylkemaweg”. By Car: If you’re driving in, you have to park the car in one of the several parking places outside the village (since the village of Giethoorn is only reachable by bike, boat or on foot afterward). All the parking places are “free”; however, it is handy to park at one of the boat/bike rental companies’ private parking, so that you can hop directly into a boat or rent a bike. By TAXI: If you have no luck with public transport, then taxi is the only option. But this is the Netherlands, taxis are always quite expensive. 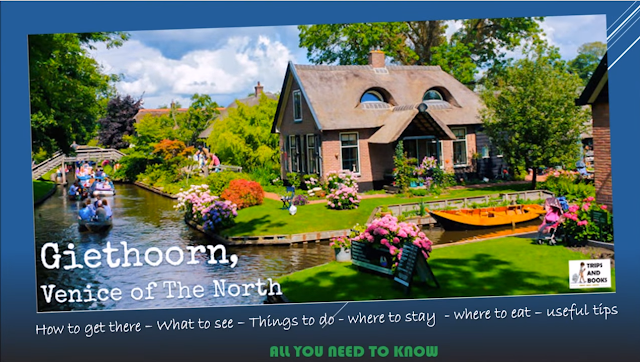 # 1: A must-do in Giethoorn is to rent a boat. You can rent your own boat or go for a guided canal cruise. This is by far the best way to explore Giethoorn. There are several boat rental options and there also different kinds of boats. You can rent a boat with an electronic motor, a canoe paddling boat, a ‘whisper boat’ or a punter. I would recommend hiring one of the electric whisper boats and self-drive. These boats are smooth, slow and are fairly easy to ride; you don’t need any special cruising skills/experience. Of course, you’ll make a few minor collisions with other boats (and that's the fun😀, no one is going to get hurt, nor complaint; these are very slow boats). Within 10-15 minutes, you’ll become an expert cruiser and enjoy the trip to the best. #2: Another option is to explore Giethoorn is by bike. There are several bike rental companies in Giethoorn. When cycling, beware of the steep bridges. If you’re not good at biking, it’s better to go on foot!. #3: You can also visit the two museums ‘Het Olde Maat Uus‘which is a typical farmhouse and ‘De Oude Aarde‘ (The Old Earth) - showcases a beautiful collection of minerals and fossils. But both these museums are very small; worth only if you have a taste to it. Since its a small village, you don’t have many options for Hotels/hostels. There are 1-2 hotels that I noticed - Hotel de Harmonie and T Zwaantje, but both of them charge more than € 100 per night!!!. There’re also some Bread&Breakfast and camping sites. You can use Booking.com or Hostelworld.com to find out the nearby accommodation options. Giethoorn is very popular among Asians, especially Chinese people. This small village is attracting an average of 250,000 Chinese tourists every year. If you’re terrified of crowds, you should avoid peak summer seasons. During my visit to Giethoorn, it was still low-season and we saw few other tourists. However, it can get really busy in high-season, so make sure to book a room and maybe even a boat beforehand. The canals can get very crowded as the day progresses. It’s better to start early in the morning so that you can enjoy the peace at its best. Boat rental companies at the beginning of the village seem to be expensive. Just walk 200-300 meters inside the village, you’ll find rental boats for much better prices. Having just visited Giethoorn 2 days ago this certainly is true. Its a heaven on earth.